Coast yellow leptosiphon. Photo courtesy of Aaron Schusteff. On December 8, the California Fish and Game Commission approved the Coast yellow leptosiophon as an official Endangered Species Candidate. Toni Corelli, a rare plant botanist and long-time CNPS supporter, successfully petitioned for the protection under the California Endangered Species Act. Discovered in the early 20th century, along the San Mateo coast, the species has been reduced to a single population of fewer than 500 plants. Today, coastline erosion, invasive non-natives, and the prospect of a nearby housing development further threaten its survival. The rattling calls of three sandhill cranes echoed across Carpenter Valley as ecologists from the CNPS Vegetation Program investigated a large fen/meadow complex last August. 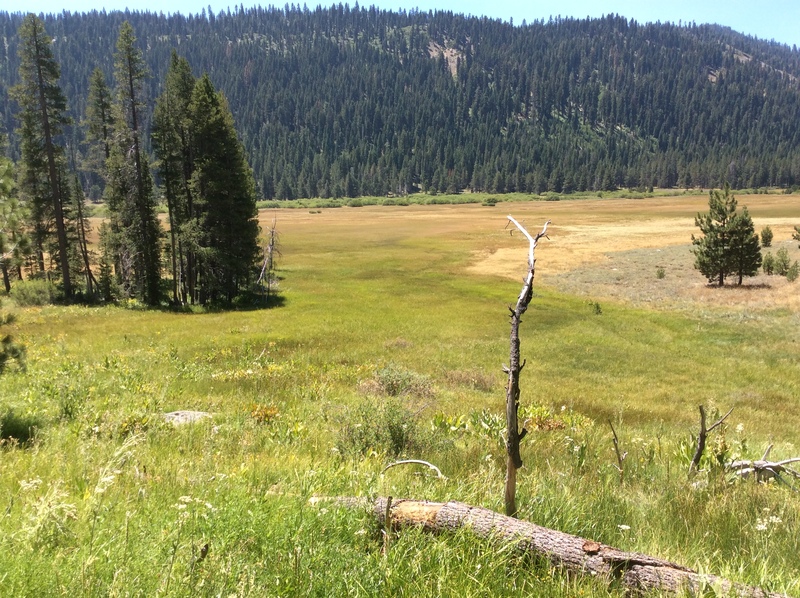 Soon, in lower Carpenter Valley, north of the town of Truckee, more than 1,000 acres of lush meadow and forest will be protected through ownership by the Truckee Donner Land Trust and a conservation easement held by The Nature Conservancy. Carpenter Valley is perched more than 6,000 feet above sea level and includes a large meadow surrounded by patches of big sagebrush (Artemisia tridentata) and conifer forest dominated by lodgepole pine (Pinus contorta). Lemmon’s willow (Salix lemmonii) lines the banks of the North Fork Prosser Creek which meanders through the site. 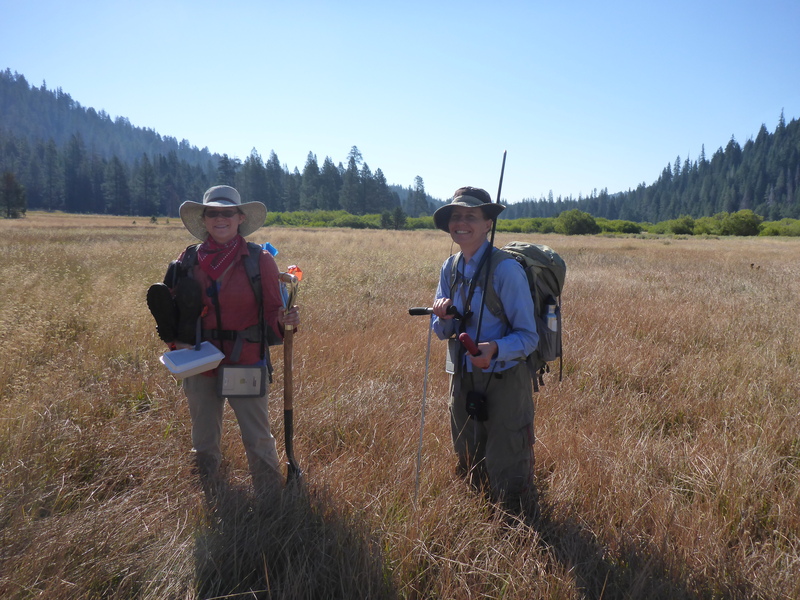 With funding provided by The Nature Conservancy, CNPS assessed and delineated fen habitats within the meadow and adjacent forest. Fens are groundwater-fed, peat-accumulating systems with perennially saturated soils. You know you’re standing in one when the cool water begins to slowly seep through your shoes and into your socks. You may even feel a floating sensation as you walk, or feel the ground move beneath if you bounce. We mapped about 30 acres of fen habitat in this area by a process of identifying wetland plant species, sampling the vegetation, digging soil cores, identifying saturated peat soils, and using a soil probe to delineate the habitat edge. A soil probe slips easily through the thick layers of peat in a fen, and you can feel the edges of this habitat by a gritty sound and the resistance of the probe as it hits mineral soil. Numerous mosses and liverworts were sent off for expert identification and small soil samples were analyzed to confirm the necessary levels of organic carbon content (>18%). We identified more than 130 vascular plants and 9 bryophytes/lichens; some of our favorites included gentians (Gentiana newberryi, Gentianopsis simplex), hooded ladies tresses (Spiranthes romanzoffiana), and marsh grass of Parnassus (Parnassia palustris). 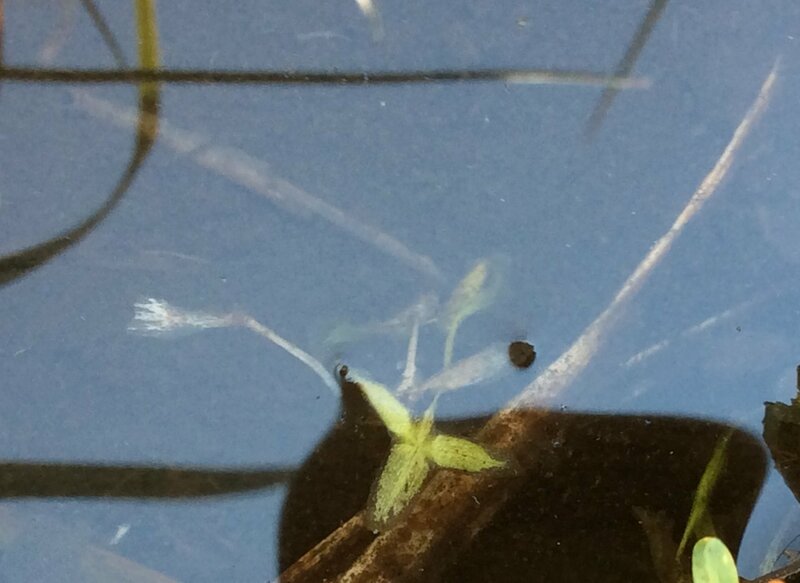 A new plant to us was star duckweed (Lemna triscula), an almost translucent triangular-shaped floating leaf that accumulates in the thin channels that braid through the meadow. Five rare taxa were found in Carpenter Valley, and only a few non-native grasses were detected during two visits on the site including cheat grass (Bromus tectorum), Kentucky blue grass (Poa pratensis) and timothy (Phleum pratense). The fens of Carpenter Valley are highly rated for conservation significance because they are relatively undisturbed, and they support rare taxa and vegetation types. Additional surveys of fen vegetation in this region will contribute to a better understanding of these rare natural community types and augment additional data regarding the statewide diversity of fen/wetland vegetation. To learn more about the Campaign to Conserve Lower Carpenter Valley click here: http://northernsierrapartnership.org/carpentervalley/. 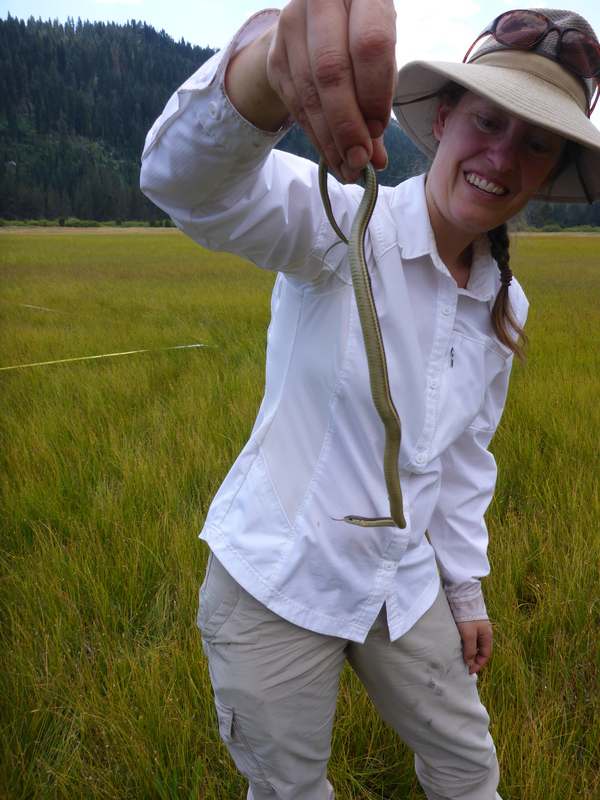 If you’re interested to know more about fen habitat, contact Jennifer Buck-Diaz at jbuck@cnps.org. Why would anyone in their right mind keep a collection of dead plants? A visit to the herbarium at UC Davis. 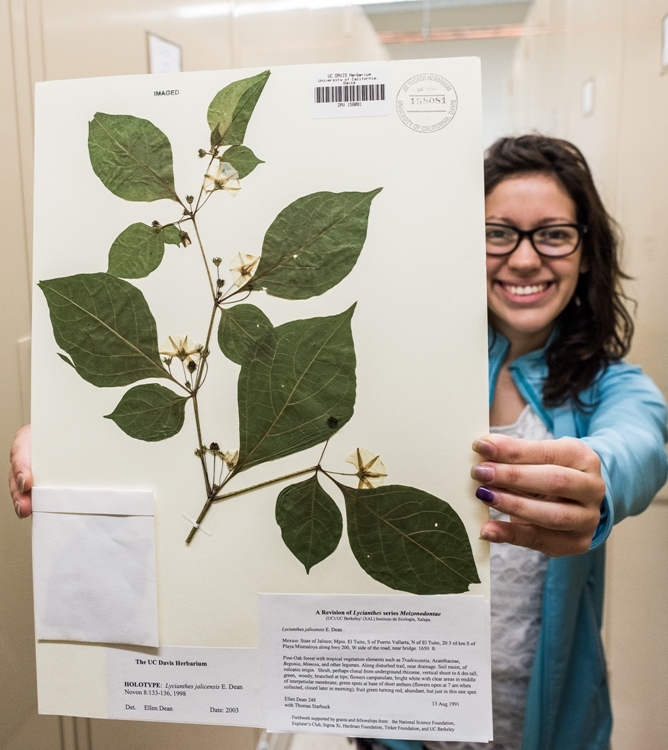 Student assistant Mayra Huerta shows off the type specimen of Lycianthes jalicensis, a species described by Curator Ellen Dean in 1998. Type specimens are the most valuable specimens in a herbarium, because they represent what an author means by a species name that they publish. Photo: D. McNair. In natural history museums around the world are collections of dead plants that are curated by scientists called plant taxonomists. These collections are known as herbaria (in the plural) – a single collection is called an herbarium. If you go to see a bug museum, you say you are going to an entomology museum. If you go see the collection of dead plants, you say you are going to the HERBARIUM! This is generally confusing, because the name makes people think that it is a collection of living herbs – like oregano. But no, it is dead and flattened plants. A flattened plant is an excellent representation of its living three-dimensional counterpart, and once glued onto sturdy archival paper, it becomes a herbarium specimen that can last for centuries (the oldest specimens are about 500 years old). Each specimen has a label that details who collected the plant and where and when they collected it. The label can provide all sorts of information about the habitat where the plant was collected, the elevation where it was found, the height of the plant, the color of the flowers, or whatever else the collector noted down. Student Margaret Starbuck demonstrates how to use a plant press. Plant samples are placed in folds of newspapers, placed between blotting paper and cardboards and then placed in the wooden press which is tightened with straps. Photo: E. Dean. Herbarium specimens can provide information on flower shape, leaf shape, leaf arrangement, seed structure, pollen structure… and much more! They can even be used as a source of DNA for sequence analysis. Plus, because the specimen label provides detailed information on when and where the plant was collected, herbarium specimens are an historical record of where and when plant species have grown. They are the basis of much of the information that is published on plant species in floras and guide books. While herbarium specimens are not as beautiful as living plants, dead specimens do not need to be watered, fertilized, or repotted. They also take up less space than living plants. The largest herbarium in the United States has over 8 million specimens! The herbarium at UC Davis as over 350,000 specimens and is a very busy place. It is housed in a museum called the Center for Plant Diversity. Herbarium staff identify plants for the California Animal Health and Food Safety Laboratory, as well as Farm Advisors, and Master Gardeners around the state. 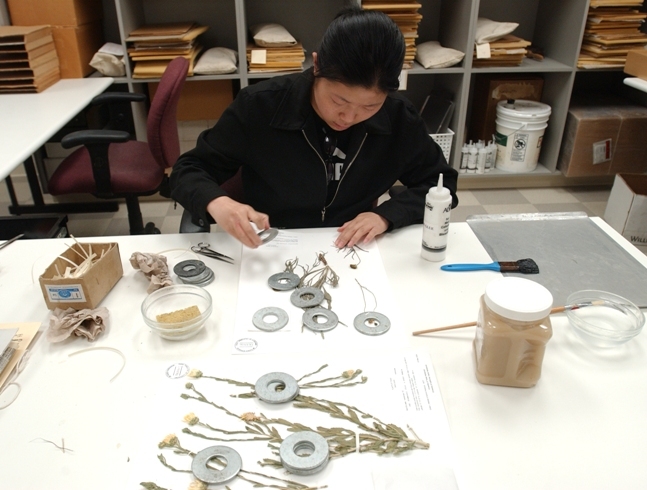 Student Assistant, Tina Ku, mounts pressed plant samples onto archival paper creating herbarium specimens. Photo courtesy of UC Davis News Service. Anyone can use the herbarium. Students and faculty with many types of research projects bring in plant samples for identification. Some students are looking at changes in grasslands or forests in various parts of California, others are studying the variation in just one type of plant or are looking at insect-plant relationships. Vegetation ecologists who work for the state of California and the California Native Plant Society use the herbarium to identify plants that they collect at their study sites; by putting accurate identifications on their plant samples, their vegetation data is much more accurate. Consulting botanists from many different companies use the herbarium to familiarize themselves with the rare plants of particular areas before they do field surveys. The herbarium’s staff and students have also been involved in many projects to provide plant lists for parks and reserves throughout northern California (available on the herbarium website http://herbarium.ucdavis.edu/plantlistsandfloras.html). Some specimens are not flat enough to mount onto paper and are kept in a bulky items area. 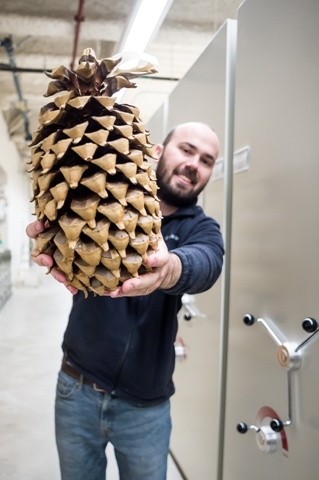 This large Coulter pine cone, held by Assistant Curator Daniel McNair, is one such specimen. Photo: J. Shepard. People often ask how the herbarium was compiled – where did the specimens come from? Many of the specimens were donated by researchers associated with UC Davis. Wild and cultivated tomato specimens were collected by tomato breeders in South America and wine grape specimens collected throughout the world by wine grape breeders. Valuable high elevation and high latitude specimens were collected by the eminent vegetation ecologist Jack Major. The specimens he collected while describing the vegetation of his high elevation study sites represent species that will be greatly affected by climate change, and they will be a valuable record of how those areas looked fifty years ago. Specimens were also donated by the California Native Plant Society Vegetation Program; those specimens represent species they assessed in the Sierra Nevada foothills. The herbarium is a valuable record of the research that has taken place in California and continues to be a valuable resource for the botanists of today. The herbarium also trains students in curation and plant identification, including a herbarium plant collecting internship and a herbarium internship. 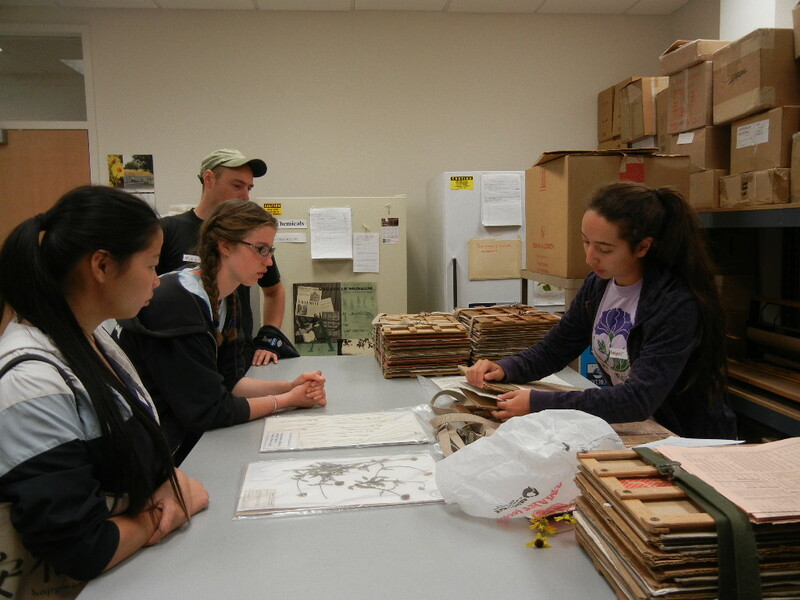 In most years, a dozen or so paid student assistants work in the herbarium. One of the current undergraduate assistants at the herbarium, Mai Xong, has become interested in our collection of Hmong culinary and medicinal herbs – a collection that was made as part of two research projects at UC Davis. Mai is of Hmong heritage and has helped us label and mount some of the specimens, and now she has been inspired to make a plant collection of her own in her mother’s garden. Mayra Huerta, another undergraduate assistant, is assisting with a herbarium specimen-based study of two species that grow in Mexico and Central America. Are they one species or two? A simple, but complex question that she will answer by making detailed morphological measurements on dozens of specimens. So, if you need help with a plant identification, you know where you can find help! The herbarium website is easy to find: http://herbarium.ucdavis.edu. Landscaping with Native Plants: How to Bring Year-Round, Low-Water Beauty to Your Gardens. Order tickets online at gardennative.org. Lunch and books will be available for purchase. Join us for a day of speaker presentations and hands-on sessions with field experts. Learn how to successfully plant and maintain native gardens; encourage sustainable native habitats for birds, insects, and butterflies; and use local resources for both new and experienced native gardeners. Girl Scout Headquarters, 1231 Upas St, San Diego, CA 92103. 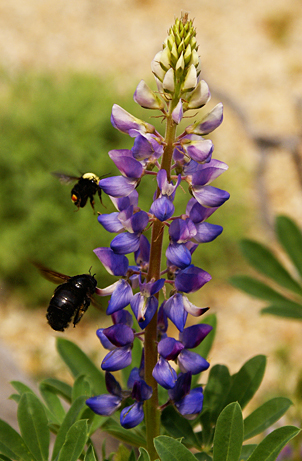 Landscaping with California native plants is a proven technique for creating low-water, low-maintenance gardens that also provide refuge for wildlife and repair the damage to our urban and suburban areas. Be inspired to create a garden that welcomes wildlife by attending the Native Horticultural Symposium Creating Habitat in the Dryland Garden at Foothill College in Los Altos Hills. There will be presentations by Judith Larner Lowry, Sara Leon Guerrero, Liam O’Brien, Frederique Lavoipierre, and Bart O’Brien. Further details available at http://www.cnps-scv.org/index.php/events/native-horticultural-symposium. symposium2016@cnps-scv.org or call: 650-260-3450 with questions. Foothill College, Auditorium 8338 in Building 8300, 12345 El Monte Road, Los Altos Hills, just off I-280. CNPS is excited to announce a strategic partnership with the Jepson Herbarium at UC Berkeley to cooperatively develop Calscape, re-launching the site to showcase its many great resources. Calscape now includes plant profiles for all recognized native California plant species, approximately 7000 in total. Nearly every plant includes a detailed geographic distribution map, built using algorithms based on over 2 million GPS specimen records from the California Consortia of Herbaria, along with detailed elevation profiles across each of the 36 Jepson geographic subdivisions. The plant maps are integrated into Google maps so that users simply type in any California address, city, or GPS location to find out which plants would grow naturally in that spot. At its core, planting a native plant garden is nature restoration work, reducing water use and helping to reestablish ecological habitats. “We’re pleased to be working with CNPS and Calscape to help facilitate nature restoration at the local level. Small changes have the potential to make a big impact on the landscape and can help combat the effects of global climate change and degradation of natural systems. Through this partnership, we have combined powerful sources of information to develop a user-friendly interface that will inspire more Californians to include native plants in their gardens and make it easy to choose and purchase native plants from local nurseries,” said Staci Markos, Assistant Director at UC Berkeley’s Jepson Herbarium. The partnership will be ongoing, which means Calscape will provide up-to-date and scientifically-accurate information on distributions from now on into the future. Plant recommendations are ordered by landscaping popularity, and cross-referenced against Calscape’s nursery database. In depth plant profiles include photos, plant descriptions, moisture, sun and soil requirements, and landscaping tips to help people choose which plants they want and how to grow them. After users identify their plant selections they can create an account and save the customized plant list for future reference as well as locate the nearest native plant nursery by going to the Calscape nursery page. The nursery page maps the locations of nurseries throughout California that offer native plant inventory, many of which have integrated their current availability into the database allowing users to view plant inventory through a Calscape ‘plant list’. This feature not only aims to help users source nearby native plant material but promotes nurseries that have a shared mission in making native plants widely available and routinely incorporated. CNPS and the Jepson Herbarium at UC Berkeley hope to use this resource to help bring native plants back to the developed part of the state, along with the birds, pollinators, and other wildlife that depend on them. With the ongoing destruction of habitat, the California drought, and the growing impacts of climate change, it has never been more important to choose native plants for our landscapes. Calscape makes choosing the appropriate native plants for any location easier than ever, giving Californian’s the tools to restore nature one garden at a time. Please help us spread the word! We drafted a CNPS policy on Preventing Infection and Spread of Harmful Pathogens via Native Plan Nursery and Plant Sale Stock, which the Chapter Council adopted last December. Collaborate with other organizations on new developments, outreach, research, programs and legislation that support the CNPS plant pathogen policy. If you want to learn more about how Phythophthoras are affecting native plants you can attend a free symposium session sponsored by the University of California on June 23 at Fort Mason Center in San Francisco (free but registration is required). If your CNPS Chapter needs assistance to implement Best Management Practices in your nursery, contact Steven Goetz at sgoet@sbcglobal.net.